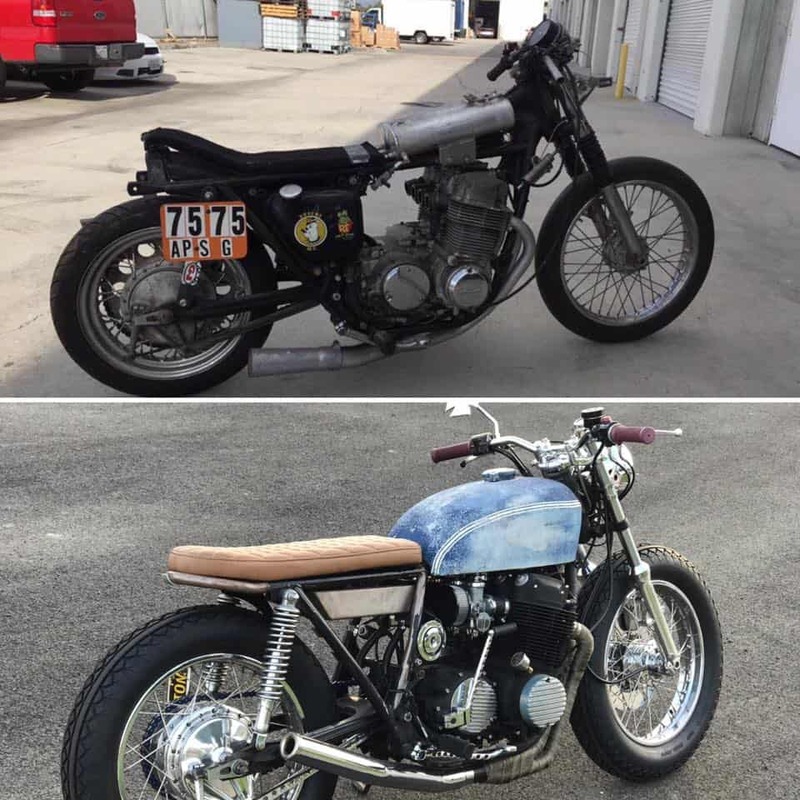 Sometime ago, I picked up a few old CB750’s in a job lot, amongst these 500 pounders was an old Dry Lakes racing Bike that was in a sorry state, but, never giving up, I put the bike to one side and knew this would be on my “To Do” list that I have. 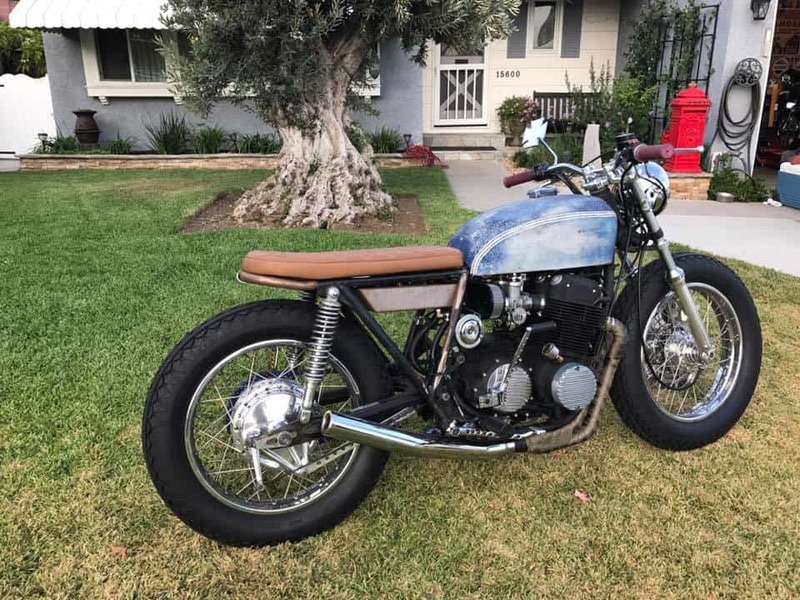 This is a 1974 CB750K series machine. Every now and again I would do a few minutes on this old bike, I managed to get the motor to turn , so knew at least we had some sort of chance at having a go at this old Girl. Well, I then stripped all the parts off that I did not need as it had a bunch of weird parts, the rear sprocket was Huge and it had a small 17 inch tire on it, the gas tanks were bolted to the frame, just old aluminum tubes with fuel lines. I rebuilt some Carbs I had and fitted to the bike, I managed to get brand New coils etc and thought I would drain the oil to see what story we had. The oil was Clear and still looked brand new, no discoloration at all, thats a good sign. 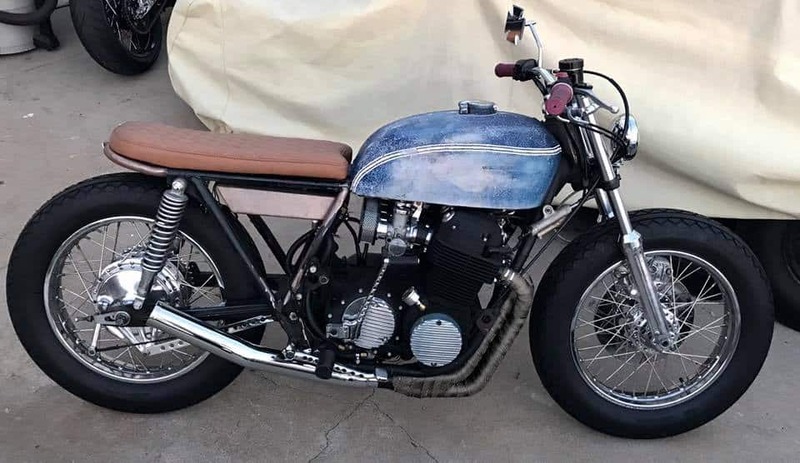 I removed the old seat and the frame was cut at the rear anyway so decided that for me, I shall build a little Brat style bike and have fun with it, just wanted to see what this would come out like. 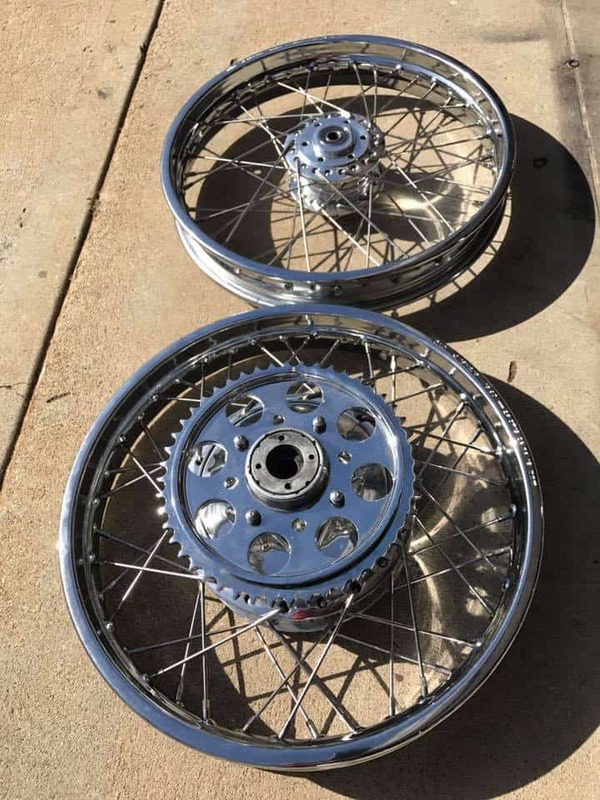 So-I removed the wheels and used 2 new rims, laces with stainless spokes and Polished the hubs etc, next up was some cool Diamond Tires, not cheap but- had the look I was after. The bike now has 2 rear 18 inch rims and sits so much better than before, I like the way that this bike is going, so the next job was to rebuild the front forks, as the tubes on the top were rusty and the seals were leaking badly. I removed the forks, pulled the old tubes and got rid of them, purchased New fork tubes and then cleaned and polished the lowers to a chrome finish, fitted new seals and then once all put together, I fitted new dust caps and custom chrome covers too. I also used genuine Honda top Caps and O-Rings to make sure all was cohesive and am glad I went this route. 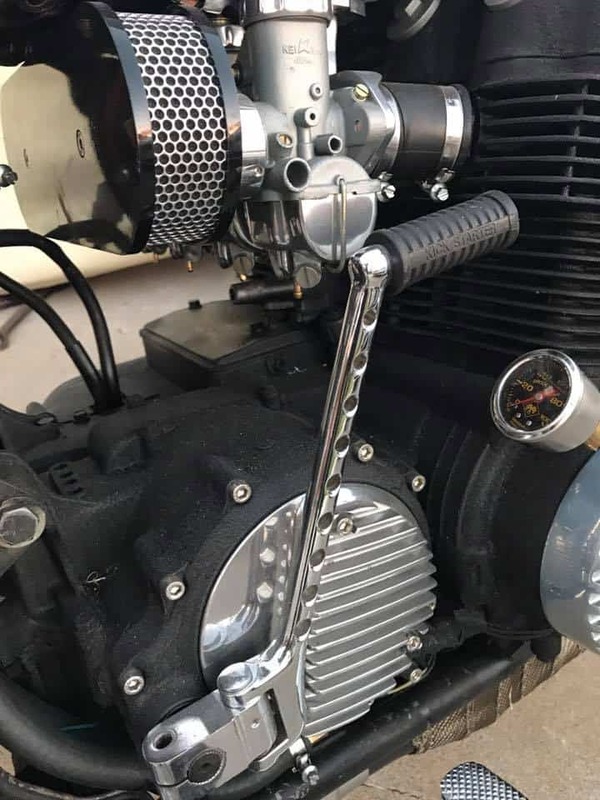 The stock carbs were totally knackered that came with the bike, so stripped, vapor blasted, Zinc Plated, Synchronized and re fitted with New jest and throttle cables etc, get the Juce to where it is supposed to go. Custom Steel Dragon Airbox purchased and fitted to make sure this breathes well and it sure does. So, to open the frame up a bit I fitted a Custom Oil tank that holds 3 Quarts of 10-40 and, holds an anti gravity 8 cell Lithium Battery and electrical, I also fitted a New solid state regulator/ rectifier and fitted under frame. 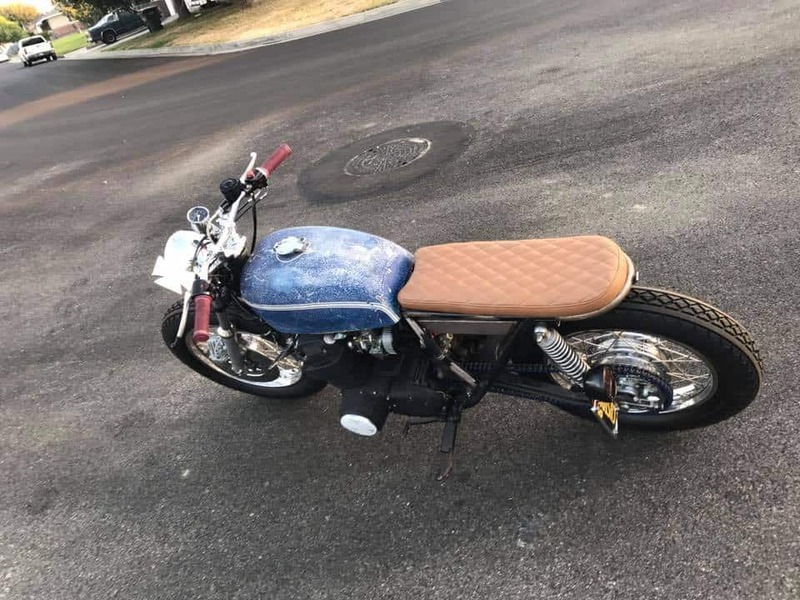 I custom made the Brat style seat and upholstered, then once that was sorted, I fitted new rear License plate frame and cool model A Ford tail light, both stop and tail light work great. Fitted a Brand New 530 Custom Blue chain onto New rear sprocket and it tensioned nicely, and seems to be a smooth action when moving. 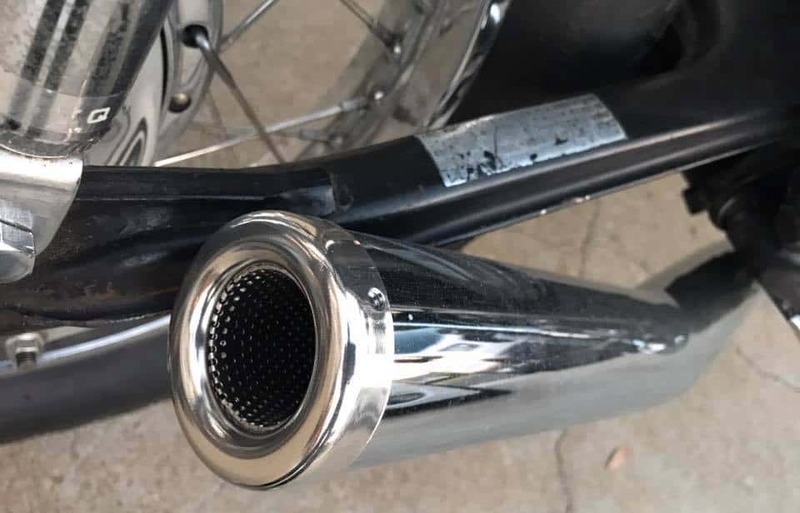 This bike has the very first Custom Performance Exhaust system that I am very proud to even offer on my website, this is called the “Sling Shot” it is wrapped in High temp Titanium on the headers and the rear is Chromed to a high finish with a Nickel Plated removable Baffle and, I love the sound this exhaust growls. Have a look and see for yourself, a VERY tidy exhaust set up that will turn many heads for sure. Fitted New Old stock Finned covers to the Motor, fitted New Clutch cable as well. 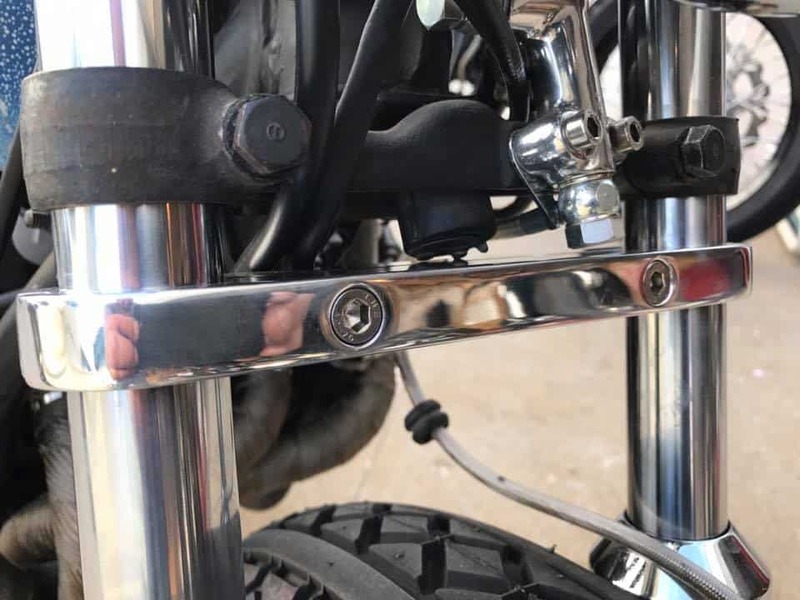 The bike also has a polished front fork brace to stiffen the front end up and a polished upper tree that also cleans up the top end. 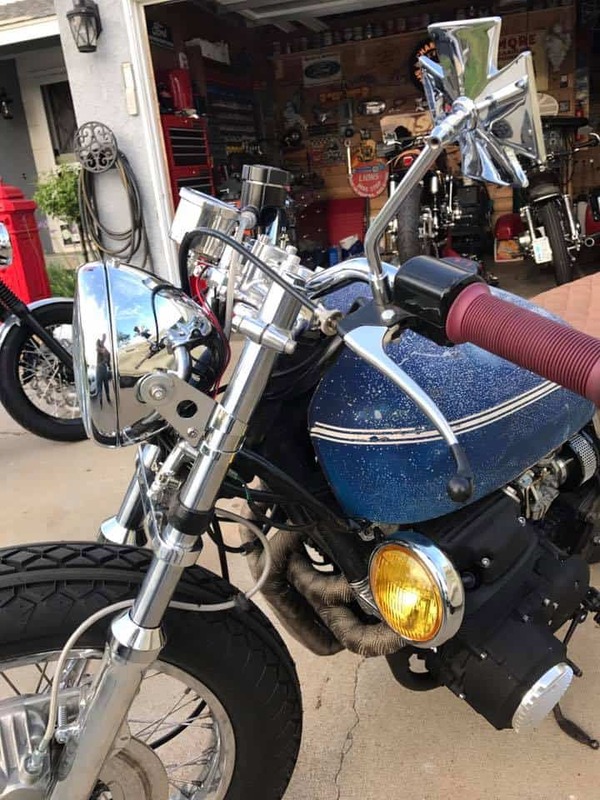 You will notice the handle bars, well I designed these and had them bent up and chromed, these are very cool and European style that I grew up with back in the England, they also have Brand New Handlebar Controls and new Grips too. 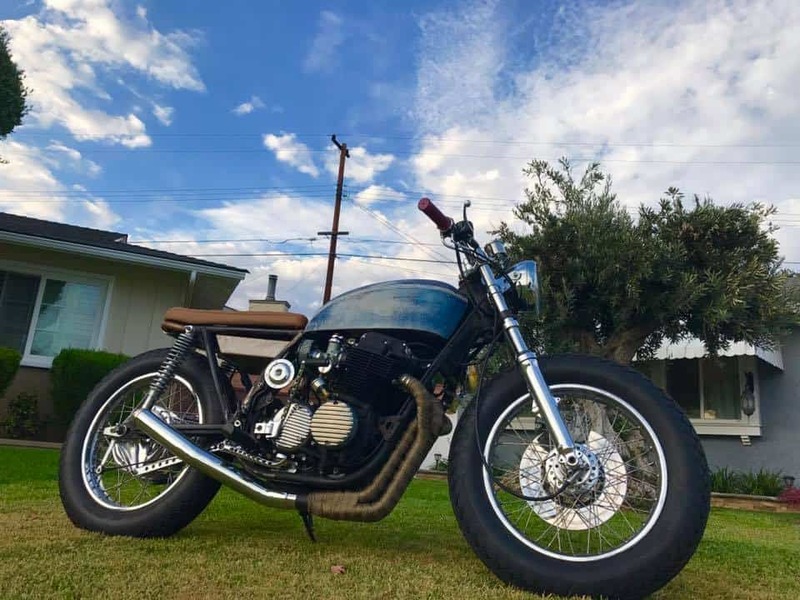 Has a rebuilt front brake caliper with a polished Rotor, to get things stopped fast, the whole front end looks so nice compared to when I first received the motorcycle. All the gears run smooth, I was super surprised, it was fun riding this around for sure. Only thing I can see is she does puff a little white smoke out of the breather, but- this has not run in 31 years so rings may need to bed in a bit. Starts right away on starter or on kicker too. 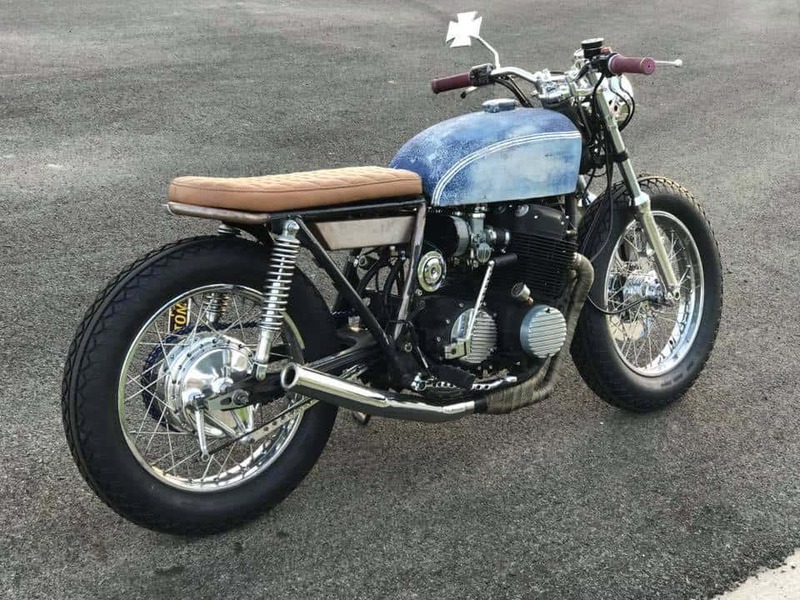 Have a look and see what you think, very cool ride for sure. A Fun ride for someone for sure. over $4200 in parts alone, so a steal at this price, you just add your touches like paint the gas tank or just have fun with it as it is. This has NO- Title I haven’t got round to it and thats why this is priced accordingly as I have other projects I need to get done and finished. A super platform Brat that I am sure can have more tricks added , like you can paint the gas tank, oh by the way, has New petcock and fuel lines too. Located in La Mirada, you can pick up, I can deliver up to 30 miles for a fee but thats up to you. I am going to add some more photos to help you get a better idea of what I did. I shall try and add a few more videos too as I will see if I can attach my phone to bike and take the bike for a run so you can hear me changing gears etc,. Here is just a list of things thats this bike now has. New Diamond tires and Tubes. New Custom hand made 7/8 Handlebars. New performance “Sling-Shot” 4 into 1 Wrapped exhaust. New oil tank with battery box. 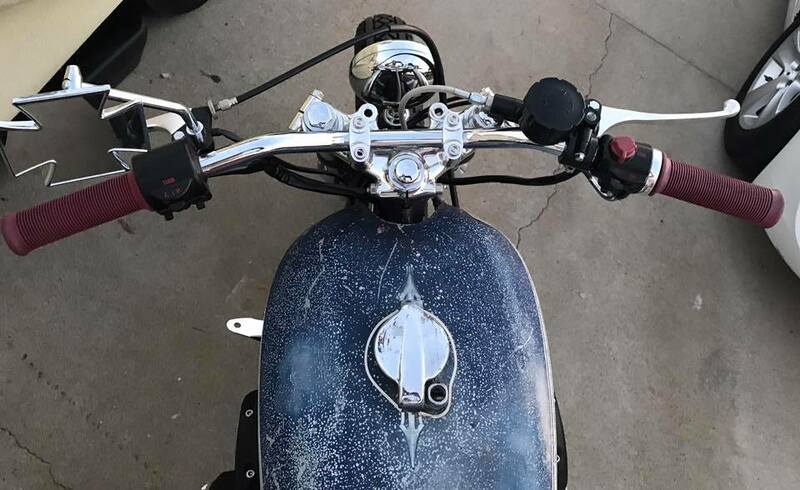 New Master Cylinder and lines. 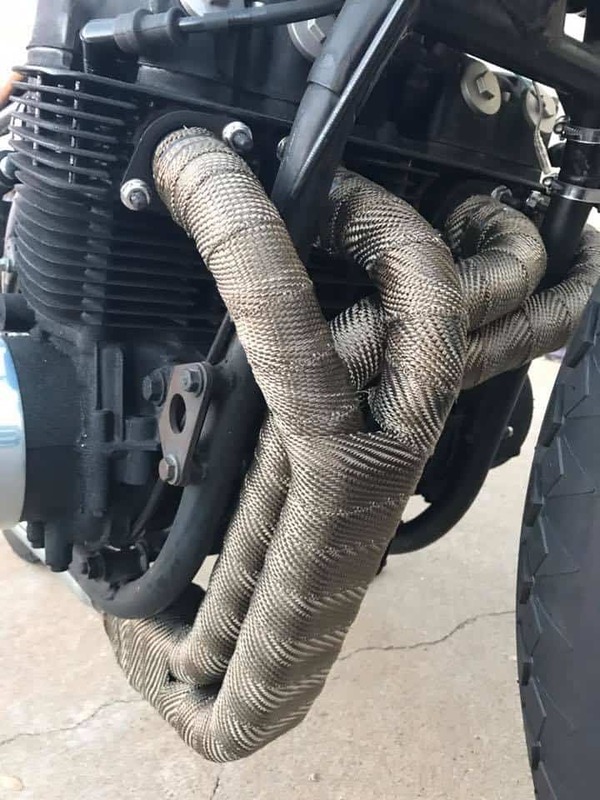 New throttle cables ( Genuine Honda). Rebuilt lowers and polished with New seals and custom caps. New genuine Honda Fork tube top nuts. New Stainless Braided Brake hose. Drilled and Chromed rear brake lever. New Hot Rod rear tail light. New polished Alloy Front Fork Brace. Custom Neutral LED light in head-stock. New shorty Chrome fork ears. New Solid State Regulator/ Rectifier. Stainless steel rolled Hose clamps. Custom Polished and drilled Stabilizer Bar. New 10-40 high Mileage Oil. 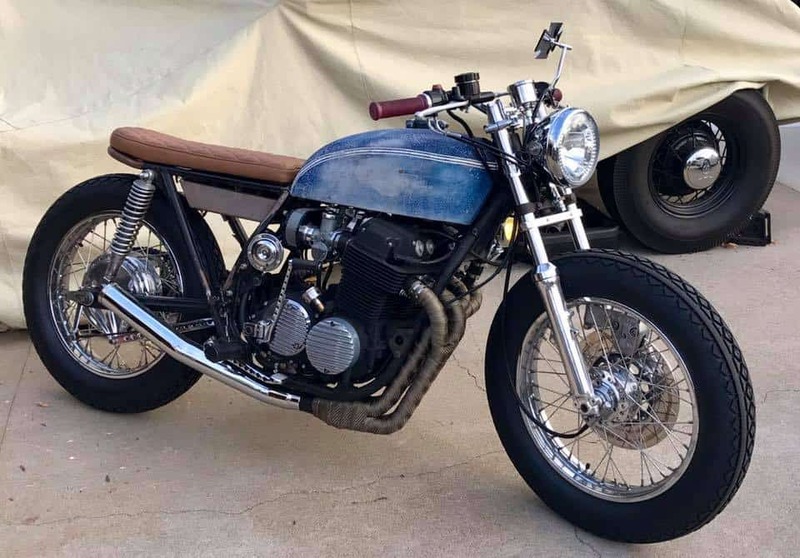 I get many compliments on this bike, its a great stance as well as sounding, and was fun to resurrect something that has not run in 30 years.. 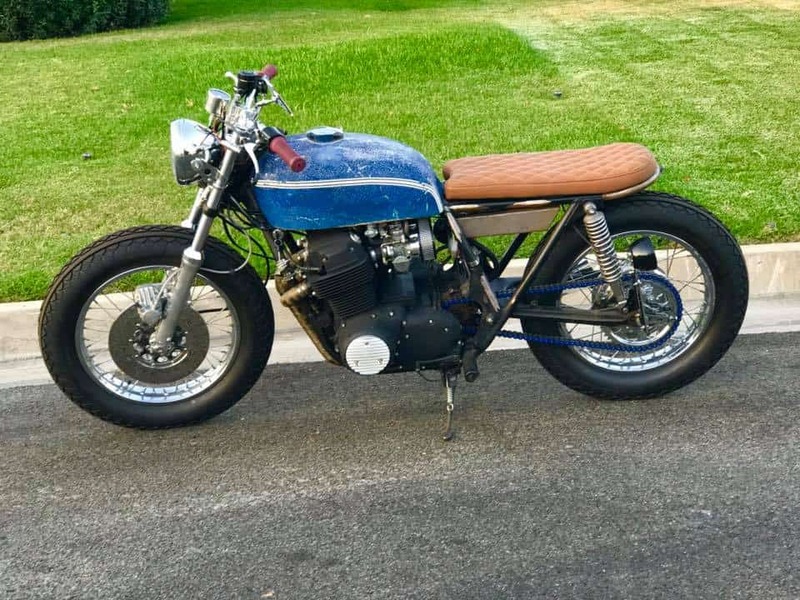 This entry was posted in Blog, For Sale and tagged brat, cafe racer, cb750, cb750a, cb750f, cb750k, classic, custom, garage built, hand built, Honda, inline four, japanese motorcycle, Shed built, sohc.